The state is seeking $1.9 billion in damages—the amount the Utah attorney general believes it would cost to locate and remove the metals, thought to be buried in the sediment beneath Lake Powell. In 2015, Americans watched in horror as a plume of bright orange sludge burst out of a Colorado mine and plunged down the Animas River toward downstream communities in Colorado, New Mexico and Utah. And then ... it vanished. As the waste wound its way down the river, scientists predicted that Lake Powell would become the final resting place for the harmful heavy metals the plume contained, and Gina McCarthy, then leader of the Environmental Protection Agency, promised that the federal government would reimburse states for any downstream damages. Two years later, the EPA concluded that the San Juan and Animas rivers had essentially returned to normal, and that, in fact, the 2015 spill had been relatively minimal—the equivalent, the agency estimated, to just four to seven days of normal discharge from the Gold King Mine. Utah, dissatisfied, joined four other entities in filing suit against the EPA, which they allege has implemented a Superfund cleanup program at the Gold King Mine site while doing little to address the contamination in Lake Powell. The state seeks $1.9 billion in damages—the amount the Utah attorney general believes it would cost to locate and remove the metals, thought to be buried in the sediment beneath Lake Powell. But where, exactly, did the spill go, and just how much waste has the Gold King Mine leaked into the lake? Scientists from the U.S. Geological Survey—with funding from the Utah Department of Environmental Quality and the EPA—are determined to find out. And while they're cognizant of the political implications, Scott Hynek, one of the USGS geologists working the case, is inclined to see the silver lining—a rare opportunity to pursue important scientific questions in a remote, understudied region of the world, and with considerable funding to boot. "Let's be real," he says. "They need an arbiter." 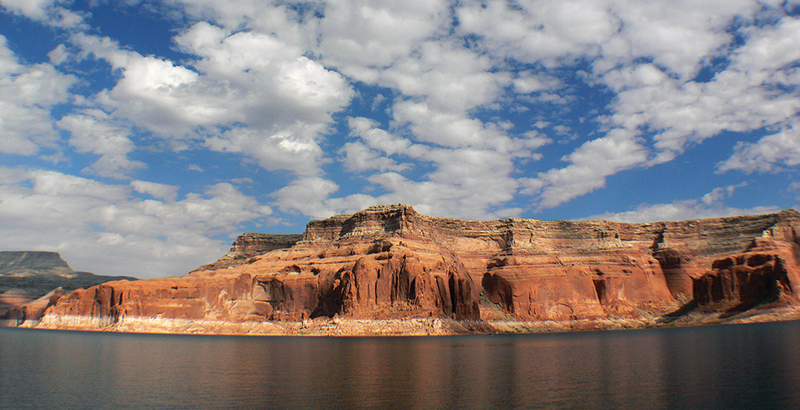 Hynek describes Lake Powell as a "sediment trap." Any material that enters the reservoir via the San Juan, "essentially gets stored right there. It does not get passed down through the dam. It does not keep going." Thus, if the Gold King Mine waste made it to the reservoir, it's still there, somewhere—as is any other contamination that has been released into the river any time since the reservoir was filled. The EPA doesn't deny this. The issue of dispute between the state and the feds is the severity of the contamination, whether it's likely to pose a threat to human or animal health—and whether the EPA ought to do more than it has to clean it up. The EPA's 2017 conclusion that the rivers had returned to its full health—or, at least, to the conditions that existed prior to the 2015 spill—was based in part on an analysis that determined the water in the river no longer exceeded federal contamination criteria. Indeed, conditions on the river more or less returned to normal pretty quickly, recalls Nancy Mesner, a Water Quality Specialist in Utah State University's Department of Watershed Sciences, which is not tied to the ongoing study. When the metals blew out of the mine in 2015, Mesner explains, they had dissolved into the water itself, which made them more mobile. But once they entered the open river, the metals rapidly became solid again. "My understanding is that things dropped out pretty fast, and incorporated into the sediment," she says. But this doesn't mean that sediment is forever buried, tucked away safe and sound. Tiny invertebrates can still pick up the sediment. When these are eaten by fish, it allows contamination—especially heavy metals—to move up the food chain. And then there's the question of Lake Powell's variable water levels, and whether the sediment in the lake's northernmost reaches is likely to stay put. "As the lake level goes up and down—this is tens of meters in either direction—that sediment that was once underwater is exposed to the atmosphere [until] the river undercuts it," Hynek says. "The sediment in this delta is quite dynamic. The fact is that it could be deposited under water and two years later be above water. A lot of these prior events are continually being redeposited." All good reasons, Mesner says, for a reputable organization like the USGS to undertake a study. "They are not what I would consider agenda driven," she says, and the state's desire for more data is a prudent one. As for the USGS—money to study an issue as localized and specific as mine contamination in Lake Powell doesn't exactly grow on trees. "If money became available, they would be foolish not [to take it], because it's so rare," Mesner says. This is the way science works at times, Mesner says: Sometimes funding for a project is tied to a political agenda, but researchers try to move forward without letting that sway the work. "I've been involved in all sorts of data collection where you've got people screaming at each other," she says. "Those of us on the ground, we just go out and do the best damn work we can do, and we don't pay any attention to that stuff." But will the study help Utah's case against the EPA? The U.S. District Court in New Mexico, where the case is currently being tried, ruled just this month against the EPA's request to have the case tossed. Given the slow progress, the Utah Attorney General's Office doesn't expect the case to go to trial for at least three years, and the Lake Powell study is slated for completion in 2020—giving plenty of time for the results to make their way into the legal proceedings. Erica Gaddis, director of the Utah Division of Water Quality, says the Attorney General's Office has reached out to her division with technical questions, but she doesn't believe the state's lawsuit is what triggered the sediment survey. Rather, the Gold King Mine incident itself shone a spotlight on a longstanding problem, which convinced Congress to release the funds that the EPA chose to dedicate to the study. The study, she says, is intended solely to determine how much mine waste is buried in Lake Powell, whether the trend is toward an increased contamination, and whether the sediment is likely to stay there. If Utah's political leaders are looking for cut-and-dry answers, scientific study isn't likely to produce them, Hynek says. Geology, he adds, deals with raw numbers. Testing the sediment will tell us how much mine waste has collected in Lake Powell—it might even locate the metals released in 2015—but it won't answer the legal question of whether someone ought to spend billions of dollars to do something about it. "There are times when you get results and say, 'Oh, there is nothing here,' and there are times when you say, 'Whoa, this is really high," he says. "But most of the cases aren't really clear cut. A lot of that is how you frame it—what risks are acceptable to society, and at what cost."